Did you download Firefox 3 already? Yesterday, the Download Day, was a big day for Firefox as it released its latest version 3.0. When the Download Day was first announced last month, I pledged to download the free browser within 24 hours after it’s release to help set a Guinness record. I have been using FF for years and always got the latest update when it became available. While FF is great, the biggest headache as I experienced is its memory consumption. I am using quite a few extensions and always have a lot of tabs opened. If I don’t restart the browser for a couple of days, its memory usage just keeps growing. It’s not rare to see that Firefox uses some 700MB of my memory. I have tried many memory tweaks with pretty much no luck. Since Firefox 3 is supposed to do a better job in keeping memory usage under control, I decided to get the browsing software as soon as it is released. Anyway, I got the software yesterday and it looks good so far. The only problem is that the browser is up-to-date, but not all the add-ons. Some of my favorite ones have been disable due to incompatibility with FF 3. One of them is called AutoCopy, which allows me to copy the text by just selecting it, no Ctrl-C needed. It’s a very convenient extension. Losing it all the sudden caused a lot of pain. So I searched a little bit and found this workaround to let me continue using the add-on until the FF 3 compatible version is available. and replace 2.0.0. * with 4.0.0. * and save the file. Click the Install Now button once it becomes clickable and the install will begin. I have used this method to install two more add-0ns, MinimizeToTray and Page Title Eraser, and they all work like they used to so far. This method may not work with all the add-ons, so you have to try to see. Until those extensions get updated, I will keep the extensions.checkUpdateSecurity value and use this workaround. wow fantastic help. I was totally flustered without autocopy. your work around is awesome. and it works like a charm. thanks a lot. u r the man! I just did one change. 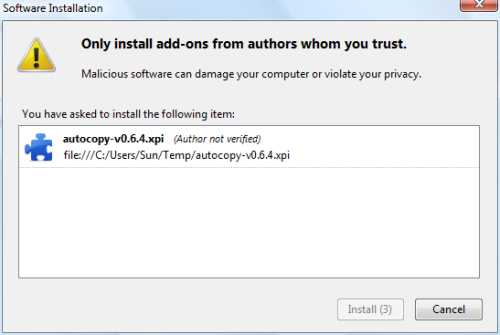 I downloaded the latest auto copy version 0.8! Thank you ! 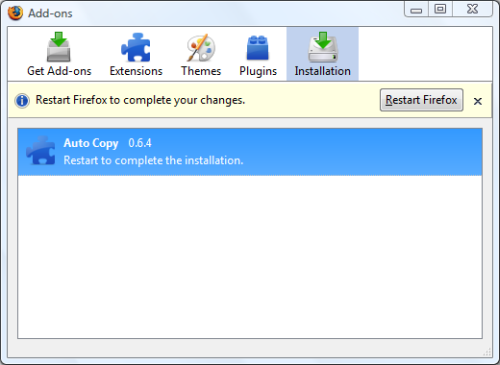 AutoCopy is my favourite Firefox extension and I was desperately waiting for an update. Firstly i want to say thankyou for the endeavor of the author which help me to use old extensions in FF3. However, this method does not work with me :(. Although i already followed all the above steps exactly, the result i’ve got is just a window reporting that autocopy does not provide secure updates (i did create and set the value of extensions.checkUpdateSecurity to false). I am glad it works out fine for everybody. This is just a temporary solution, though. Hope we will get the update soon. I just installed an old and forgotten EndNote plugin into FF3.